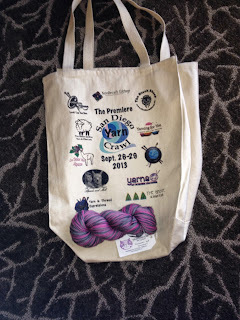 Well I might not have had a Martini in my hand, but they were very much on my mind as I went crawling along at San Diego's first ever yarn crawl last week. I was thinking about the Martini I would enjoy as I sat and perused my latest local yarn finds. I was able to visit only 4 of the stores because it came during the last days of our vacation. Next year I will know better! I discovered three new yarn shops that I really enjoyed. I really loved The Grove (http://grove.lucyslist.net/) because it is a combination book store, fabric, craft and yarn store. I was in crafting heaven. I could have stayed the entire afternoon in total bliss but I had the husband along and a puzzle will only keep him occupied for so long. As it is, I left there with some local San Diego yarn done by a company called "The Grinning Cat", along with a few fun books about the Day of the Dead, oh, and some fabric. My other favorite store is up in Encinitas, it's called Common Threads (.http://www.fiberartshop.com/) Owner Nancy is one of the friendliest owners I have met. From the street it looks like a tiny little store. However, it goes on and on inside and is crammed with lots of yarn goodies. I got some yarn specially hand dyed for them for the yarn crawl. It's a beautiful multi color yarn with a strong colorway. I also came away with some fun knitting accessories from Slipped Stitch Studios. I especially love the needle pattern wallet and coordinating magnets. I was so taken with her things that I made the mistake of getting online only to discover that she has a bag of the month club and that this month the bag is made from "Nightmare Before Christmas" material. Did I order it? All I can say is that Oogie Boogie made me do it and it is my birthday month. Also in Encinitas is The Black Sheep http://www.theblacksheep.biz/This store had Noro hanging from the ceilings and in many bins. I have never seen so much Noro. I was in Noro heaven. They also had a full selection of Louisa Harding ribbon which is super hard to find. I came away with several different yarns that will be knit into a very bohemian looking shawl. For the yarn crawl they had a tassel make and take that was a lot of fun. So many color choices and a great idea for all of those left over bits of yarn. Finally, I visited my favorite old standby, Needlecraft Cottage (http://www.needlecraftcottage.com/) in Pacific Beach. They carry a local yarn called Baa. I picked up a skein along with a pattern designed b the folks at Baa so I can have a San Diego scarf. They also carry some wonderful stitch markers that are made locally which I could not resist. 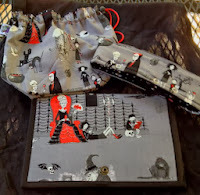 I also picked up two Halloween cross stitch bead projects while I was there. 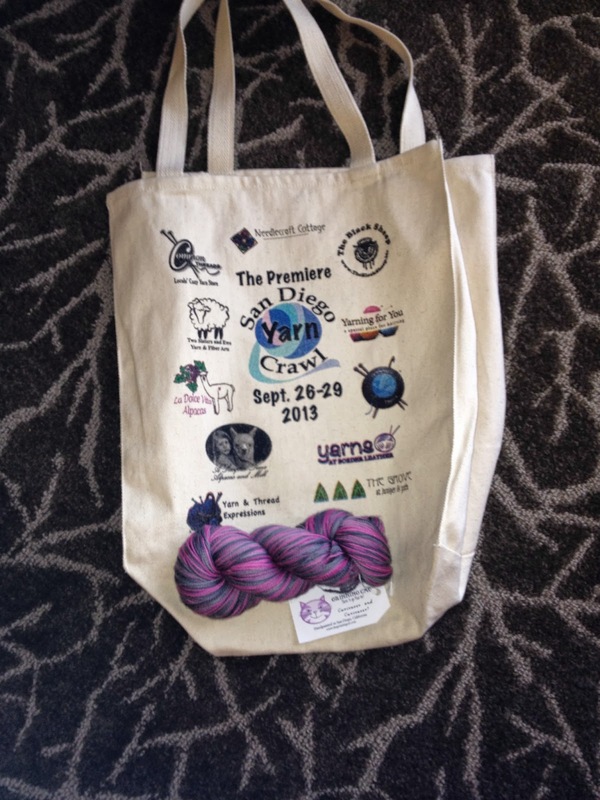 Not only was this San Diego's first yarn crawl, it was also mine. I have missed the one in my home town of Denver and the one in Portland Oregon by a week. While i was milling around one of the stores, One of the other shoppers told me about the group of ladies who rented a limo to squire them around for the day so that they didn't have to drive AND so they could enjoy some adult beverages in between. Martinis anyone? I'm in!